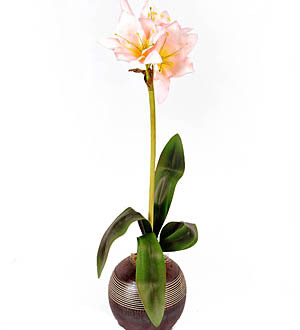 Elegance and originality are the keynotes of this Amaryllis Vase arrangement. Cool and modern - without being consciously trendy - this new look for Amaryllis shows all the signs of becoming a contemporary classic. Delicate and pretty, this stem of Fleurwood’s Natural Latex Greenish White Green Amaryllis Flower is perfect on its own or added to an arrangement. Detailed and beautifully realistic, it adds a wonderful touch of glamour. The real beauty of natural foam flowers is that they last forever; season to season in perfect bloom with no watering, pruning or wilting. At Giftlab we are passionate about imitating nature with absolute precision, and that's why we study real flowers and plants as a reference for each design. The results are blooms so lifelike that even the bees are fooled! Available in White Green and Pink.Strikingly simple, Fleurwood’s tall Amaryllis illustrate the traditional color of Greenish White make a dashing difference – there's no mistaking these lifelike amaryllis stems are as real as life. As part of natural latex flowers display or arranged by themselves – the results are fabulous.Each Amaryllis Flower Stem measures 78cm in length and the flower 20cm in diameter. 3 Days' notice is required for out of Klang Valley delivery. For colors customization, call us at +603-78830233.